Now Revised and Expanded in an Enhanced 2-CD Program! As a salesperson, you know what THAT excitement is all about. You’ve felt it, you’ve lived it, you’ve dreamt about it. You want it, and you want it all the time! For Unlocking The Sales Genius In You! My name is Mike Brescia, President of Think Right Now! International and creator of the world-renowned Accelerated Sales Success Now! program. Over the last few years, this CD program has helped over 7,200 salespeople break through all kinds of barriers and succeed beyond their wildest dreams. Releasing Fear of Failure Now! Releasing Fear of Success Now! Thanks to this program, even the most de-motivated “order takers” have been transformed into blood-thirsty prospectors and never-say-die closers—and today many of them are in the highest income bracket in the world - and loving every minute of their sales careers. I should know – because I was one of them. Back in the early 1980s, I was the smartest lousy salesman on the planet. I read sales books, listened endlessly to tapes, attended some seminars, and rehearsed like I was auditioning for a Broadway play. You name it, I did it—yet I couldn't sell anyone. And I mean nobody. Self-doubt, worry, fear, frustration, and rejection defined my life in the sales world. My biggest selling problem was ... me. I could rattle off openings, presentations and closes when practicing... everything salespeople are supposed to know, but I was so afraid when I picked up the phone, knocked on a door and started talking to a prospect that my brain seemed to shut off, and I sounded like a bumbling idiot. The light bulb finally went off while in a bookstore in Hermosa Beach, CA reading the book, "Superlearning." My idea was that if I could combine a revolutionary accelerated learning technique I had just read about with the proven power of positive sales oriented affirmations in a simple audio program, I could learn and condition my mind to think like the greatest salespeople who ever lived. I believed that if I could get rid of my fears and doubts and visions of failure, and replace them with positive beliefs and attitudes that the most successful sales people in the world had, I should be able to sell like they did. So in June of 1987, with borrowed 2 cassette players and a recorder, I made my first audio program using every positive attitude, thought, belief and action I could find from dozens of sales, psychology, and motivational books. I listened to it religiously. I read the statements. I wrote them. Religiously. And in a matter of days, I could feel something beginning to take hold. In a few weeks, my “luck” began to change. What I was doing was so effective at changing my mindset that within weeks, I was working 7 days a week and closing sales like I never imagined was possible—for anyone, let alone me! I gained such complete and total mental focus and self-discipline, that over the next 9 years, I obliterated sales records became the highest paid sales executive in three completely different industries—just by installing the winning beliefs and attitudes of top salespeople into my mind. And I had been living in a van shortly before I started my transformation! My closing ratios were absolutely ridiculous... triple industry averages. And now, my friend, it’s your turn to set the sales world on fire. My results with “Accelerated Sales Success Now” and “Setting and Achieving Goals Now” have been nothing short of spectacular. When I ordered the programs (both of which were over a year ago I believe), I listened a few times and was very impressed, however, I did not listen to them again for several months. I have a tendency to always be on the lookout for the magic bullet without giving things much of a chance. Anyway, after reading several testimonials of other people getting great results, It dawned on me that the magic bullet was already in my possession, I just needed to make the commitment to listen to them on a daily basis. 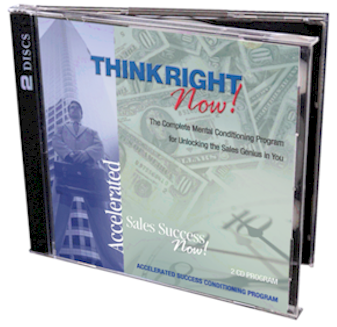 I began to see results within 2 short weeks of listening to the Accelerated Sales Success CD. I’m not sure how it happened but I somehow increased my vocabulary, or at least tapped into a resource I never knew I had. My presentations felt flawless and smooth, and my region climbed to the # 1 spot in sales and has remained there for over a year now. I’m really not sure how you’ve done it … BUT THESE CD’S FLAT OUT WORK!!!!! The Setting and Achieving Goals CD is equally impressive. I used to just go through the day not knowing how to prioritize and complete tasks, but now I find myself thinking about, writing out and executing actions that knock out projects systematically…. WOW! These CD’S have literally installed thoughts into my brain that give me a drive to go out and make it happen ….. AUTOMATICALLY. There’s no longer any hesitation or second guessing when it comes to a sales call, and no more drifting through the day without a clear cut plan and determination to make it happen. You folks are doing a great thing up there. I appreciate you! You don’t have to be a “born salesman” to become a Master salesman. Nor do you have to have great charisma or a "suit of lights" personality. You don’t need an advanced degree in marketing (or a degree at all). You don’t need to be a psychology major or be a silver tongued rascal. You don’t have to develop master sales skills the hard way or suffer through years of trial-and-error barely making a living. Plus, you don’t even have to be in sales to benefit from Accelerated Sales Success Now! If you’re head of the PTA…. If you’re a stay-at-home mom…. Then Accelerated Sales Success Now! is for you, too. Why not see for yourself? Sales Training Gives You the Tools. Mental Training Gives You the Edge. If you’ve put in your time training, reading books, attending seminars, and spending mind numbing hours on the phone—only to be sabotaged by some invisible barriers you just can’t seem to get past—Accelerated Sales Success Now! can be the final piece to the success you crave and deserve. Great golfers, tennis players, and other world-class athletes will all tell you the mental game is the single most important aspect of their success. Great salespeople will tell you the same. And you can see it in their game, too, when someone with no experience can come in and beat battle-tested veterans within months (or even weeks) of starting in a new industry. There’s simply no escaping the power of the mind in selling. You know it. I know it. It’s that same mental training that’s going to take you from where you are now and turn you into a selling machine. You’ve got to be able to motivate and push yourself. You’ve got to control your own mind states or you’ll never be able to direct anyone else’s. You’ve got to erase the self-doubts and fears and replace them with confidence and conviction ... or success will always elude you. Accelerated Sales Success Now! will make this all happen and so much more. It literally alters your unsupportive thoughts, beliefs, attitudes and emotional habits to be more like the quota-busting salespeople who get the results no matter what the competition does or what the economic climate is. The change is real, and it occurs inside you at the deepest levels. It makes all the sales training you’ve ever absorbed FINALLY work the way it’s supposed to. Because instead of stuffing your brain with more information but having no real faith, no drive, no will, no persistence, no determination and thus no achievement, now you will now have all those things and more with almost no effort. Your hidden talents will finally come out of hiding. You’ll become a goal achieving sales machine, earning more money than ever before. And incredibly, you'll love every second of it! "I just keep prospecting and closing"
"Oh my God! I just had to write and say thanks. I've had your sales program for about 3 months and my sales are just exploding. I just love selling now. I used to be pretty negative when things would go wrong, but now nothing bothers me at all. I just keep prospecting and closing. It's amazing. My co-workers want to know what got into me. I love you, Mike!!!" "We used your techniques and bought CDs for my sales people and we've increased sales 12% in under 60 days, using the Accelerated Sales Success program." Accelerated Sales Success Now! Retrains Your Mind! The first component in each active session is the audible delivery of the material on the CD, which uses a world-famous accelerated learning method to speed and maximize retention of the new attitudes and action habits. Developed by famed psychotherapist Dr. Georgi Lozanov and called Suggestopedia, it’s been a foundation of “super-performance” conditioning programs for over 40 years. The third component is the “attraction” statements. These statements work to help you develop powerful new belief, attitude, and thought patterns, and give you emotional triggers that make selling easier and downright enjoyable. You will naturally become able to do and say the things that will help you achieve dramatic sales success—and develop the undying determination to get better and better at it. Important note: Accelerated Sales Success Now! is NOT a subliminal program. On the CD portion of the program, you can hear every word clearly. The more you listen to the CD and use the other conditioning techniques you'll be given, the faster the positive thoughts, attitudes and behaviors of the most successful salespeople alive will take root and influence you every hour of every day. It’s that simple—and your results are guaranteed. You’re invited to see for yourself with no risk at all. Just click here. "I rarely lose a sale these days"
"I rarely lose a sale these days whereas I previously lacked confidence and credibility. The CD has somehow helped me to develop an incredible rapport with my clients, my focus is 100% on providing the best solution for them. Consequently they all seem to trust me and the order is assumed. There is absolutely no dread of closing now. It is no longer an issue. There is no pressure on my clients and no pressure on me. I now actually enjoy meeting new prospects and getting involved with their concerns. I'm really not even thinking about my commission anymore which previously was my sole preoccupation - totally self defeating obviously. My confidence has grown now to such an extent that I have now formed my own corporation and will be training others to succeed as I have done. I am recommending your Accelerated Sales CD to all our trainees." Anxiety and fear can rob you of your courage and make great performances impossible. Self-doubt makes even the easiest decisions feel difficult and causes procrastination. Frustration and Anger at lost sales rips your focus away from your goals. Jealousy and envy create dishonesty, hate, and tension. These types of thoughts and emotions are the only things that can truly stop you. But once they’re planted in your head, it takes more than good intentions to get rid of them. That’s why you must eliminate the deep-seated mental patterns that cause these negative emotions to grab you by the throat and stop you—or they will always be that “little voice in your head” that talks you into feeling powerless and unable to sell even the "lay downs." For example, consider the salesperson who, as a child, was regularly belittled and made to feel like he or she wouldn’t amount to anything. The resulting beliefs make being a champion salesperson nearly impossible. Today that salesperson may feel personally rejected and become despondent from simply missing a sale. So instead of being excited about the possibility of developing a new business relationship, they expect to fail before they even pick up the phone. Your privacy is assured. We never rent, sell or share emails for any reason. It's because your conditioned mental patterns (beliefs, thoughts, attitudes, emotions) control all of your automatic, unthinking actions like auto-pilot on a plane. They are what cause you to always feel and act in the same ways in similar situations. Dread before making cold calls. Nervousness during a presentation or meeting. Doubts that you made a good first impression. Fears that you’ll be rejected by a prospect. Anticipation that you’ll fail no matter how hard you try. Self-loathing when you fail to close a sale or advance the sales process. If you want to change these inner and outer habits once and for all, accelerated success conditioning is for you. Accelerated Sales Success Now! takes dead aim at all the underlying negative mental patterns that are undermining your states of mind, your performance and your success. It’s the ultimate solution to root out this kind of negativity and replace it with the positive mindset of success. It will renew your confidence, your love of sales, and your skills. It has helped thousands of salespeople—and it will help you too. See for yourself. Click here now! Behavioral scientists estimate that we are told “No!” and what not to do nearly 150,000 times before we reach the age of 18. Negativity literally gets programmed into us from infancy and it sticks for a lifetime. Over 75% of our thoughts are negative, counterproductive, or working against us in some way. Negative thoughts are dominant in our minds simply because negativity is a major part of our upbringing, even in otherwise perfectly “healthy” families. Success Blockers. Blast 'Em Out! Accelerated Sales Success Now! bombards your mind with “releasing” statements that reject all of the unsupportive mental patterns that stand in the way of your success. Through repetition, these scientifically developed sales affirmations overwhelm and ultimately erase the fear, self-doubt, self-blame, and other limiting mental patterns until their influence over you is virtually nonexistent. How Accelerated Sales Success Now! Accelerated Sales Success Now! is NOT a how-to program. It’s even better. It is a transformative program that works on a simple premise: when you burn the thoughts, beliefs, and attitudes of the world’s most successful salespeople into your mind, you will soon feel how they feel, do what they do, and so you get the same results they get. Accelerated Sales Success Now! makes this imprinting process effortless and automatic—like downloading software onto a hard drive. It does this with a proven, stress-reducing, and accelerated learning process that gradually but steadily rewrites your mindset at the most deeply rooted unconscious levels. It’s NOT “how to” lecture-based advice on how to sell better. You can get sales training in hundreds of books, videos, seminars and even in-house where you work—but you can’t get this kind of mental sales training anywhere else! It’s NOT a “motivation” pep talk that simply fires you up. That approach doesn’t last. Talk is cheap. You get pumped up for a day, then slip back to old habits fast. No how-to book or video will give you the confidence you need to help you get up after you keep falling down. No lecture or seminar can implant unstoppable determination to do whatever it takes to succeed. Accelerated Sales Success Now! does both ... and so much more. Wipe out any and all restricting beliefs and attitudes—even barriers to achievement that are buried deep in your subconscious mind? Mentally rise above and go beyond every perceived limitation you have? Burn into your subconscious mind the beliefs, behaviors, and attitudes of the very best performers in your field? Our Success Stories page is filled with thrilled clients who have doubled, tripled, even quadrupled their sales and their income with the help of Accelerated Sales Success Now! Isn’t it time you wrote your own success story? Start yours by clicking here now! You’ll have the ability to simply shake off the distractions. No fears, no doubts, no worries. Setbacks will feel like speed bumps, not roadblocks. At last, you will think, act, and feel like the confident, resilient winner you were born to be. ...and that’s where the dozens of attraction statements in Accelerated Sales Success Now! step up and go to work. Sound good? You know it does. For less than the price of a couple of books on sales technique — and much less than you’d spend on a sales seminar — you can put your sales career on a rocket ride to success. If you can spare just 10-30 minutes a day, Accelerated Sales Success Now! will install powerful attitudes and beliefs in you which will drive your sales and sales career to remarkable new heights. Naturally, the audio portion of the program works best when you can listen in a quiet, relaxed setting. Listening before you go to bed or before you start your day is ideal. In fact, many people just play the program while they sleep. For many clients, this has proven the best way of all. However, you can use it wherever you can find a spare 60 seconds (even in the bathroom! ): during your commute, before sales calls or presentations, on your lunch break, you name it. In total, there are seven (7) ways to use Accelerated Sales Success Now! Any one of these methods can take you from a kitten and turn you into a selling lion and they only take a 10-30 minutes a day total. Not a bad investment in time to change your entire life. The more you immerse yourself in Accelerated Sales Success Now! the sooner you’ll become the fearless, success-driven salesperson you want to be. It’s as simple as that. You Can Use Accelerated Sales Success Now! Important Note: When you begin Accelerated Sales Success Now! you may experience slight feelings of agitation. Changing lifelong behaviors is not always comfortable at first, as your mind may resist clearing out the old “comfortable” habits and welcoming in the new. If you experience an initial increase in anxiety, it means the program is working. It will subside in just a few days. After that—you’ll be cleared for takeoff and the positive, life-changing results you want will begin to emerge. You’ll never look back! You’ll become invested in the sales process like never before, and develop an enthusiastic, deep-rooted belief in everything you do. You’ll connect with more prospects, make the most of your selling time, and forge alliances with all the right people. You’ll close more business and waste less time, and watch your sales grow and grow and GROW — and your income will soar along with it! All I ask is that you give the program an honest chance, and this six-month guarantee gives you every opportunity to do so. Guarantee #1: Your decision to try this program is 100% risk-free. If you are not satisfied for any reason, simply return Accelerated Sales Success Now! within six months and you will receive a full refund of the purchase price. No hassles, no questions asked. Guarantee #2: Your small investment of just $59.97 is a one-time purchase. This is NOT a subscription program that lures you in with a low introductory price, and then sends you materials you don’t want. You’re under no obligation to buy anything else, and nothing else will be sent to you. Guarantee #3: Your purchase is 100% private and your privacy is 100% protected. We will never sell or give your name and address to any other company or organization. Period. I already know what Accelerated Sales Success Now! can do, and now I want you to see for yourself. You be the judge. That’s what our Six-Month Money-Back Guarantee is all about. So why not give it a chance? Click here to order your no-risk copy of Accelerated Sales Success Now! P.S. If you’re still mulling it over, click over to our Success Stories page where you can read even more testimonials written by clients who are thrilled with the success they’ve enjoyed with Accelerated Sales Success Now! And here’s the link to our How it Works page again, if you want read a more detailed explanation of the Think Right Now! Accelerated Success Conditioning process. Remember, your satisfaction is guaranteed completely and you’re protected by our famous 6-Month No-Risk Guarantee. Don’t you owe it to yourself to give it a try? P.P.S. While you’re here, sign up to receive my FREE email newsletters that are filled with success-focused tips and insights. It’s completely free, and your privacy is assured: we will never rent, sell, or share your email address for any reason. I'm writing to tell you about the great success I've had using “Accelerated Sales Success Now” program. After about two years of mediocre sales results, I got your sales success CDs and began listening to them every night. After the first few nights of listening, I began to think differently about everything related to selling. All of the prospecting and following up that I used to dread in the past started to get much easier. One of the things that I noticed early on is that in ways I stopped thinking, and just started doing. I would often over think and find ways to justify and talk myself out of prospecting and cold calling, but once I started listening to the CDs, it was as if that nagging voice inside me that held be back from prospecting was gone! I now have absolutely no fear of prospecting at all thanks to this program. I also find it very easy to ask for the order, and when the situation calls for it, I have no problem closing three or four times if necessary. Before listening to your CDs, I was lucky if I found the courage to try to close once during a sales meeting. One of the biggest benefits that I've gotten from the CDs is the ability to not get down when I lose a sale. If you are in sales, you will lose sales that you thought you were going to win. In the past, I allowed losses to affect my performance, but now they don't really even phase me because I know that I will get three or four to replace it. Thanks for a great program! Orders placed by 8:00 AM EST ship the same day! Want to Phone or Mail your order?